Senate will vote down Syrian refugee ban, reports say. 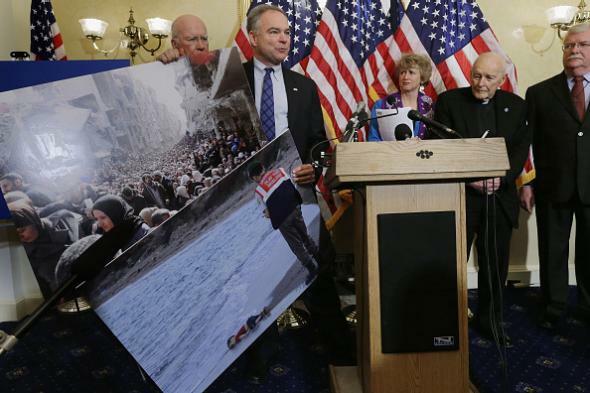 Democratic Virginia Sen. Tim Kaine at a press conference about the Syrian refugee crisis on Capitol Hill on Dec. 8, 2015. A bill that would bar Syrian and Iraqi refugees from the United States unless they receive security “certification” from the FBI and Director of National Intelligence is expected to be taken up by the Senate this week but is considered unlikely to win the 60 votes that would be needed to overcome a threatened Democratic filibuster. The bill, which the White House opposes as impractical, passed the House of Representatives easily. The measure, which House Republicans presented as their opening response to the Paris terror attacks, passed that chamber in November on a veto-proof vote of 289 to 137, thanks to the help of 47 Democrats who joined Republicans. But the backlash from pro-immigrant, refugee, and Muslim groups – as well as increasing anti-Muslim sentiment from Republican presidential candidates – drove many of those Democrats to ratchet back that support … If it somehow reached the president’s desk, President Obama has has already threatened to veto the bill anyway. The U.S. already has a substantial refugee screening process in place, and no individual fleeing Syria is known to have committed an act of terrorism on U.S. soil. While some of the men responsible for the terror attacks in Paris and the New Year’s Eve sexual assaults in Cologne, Germany, are believed to have arrived in Europe as asylum-seekers, the U.S. takes in far fewer Middle Eastern refugees than European countries and checks them more extensively; in all, the Guardian calculated in November, only three of the roughly 785,000 refugees of any background admitted to the U.S. since 9/11 have been arrested on terrorism charges.